A company not yet represented on this site is Trent Motor Traction, so this photo is to rectify that omission. 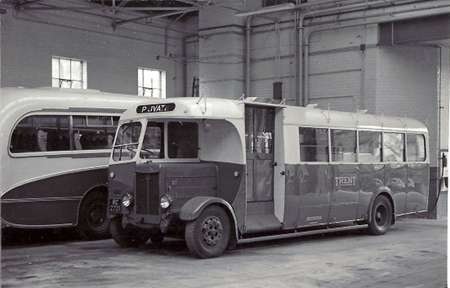 In the early postwar years, Trent took delivery of a large number of AEC Regals with Willowbrook bus bodies. 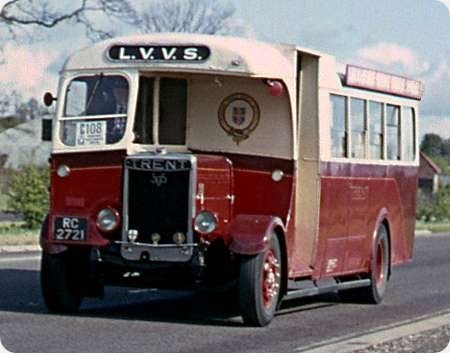 In 1958, some 20 of the Regals were modernised by Willowbrook, who fitted a full front, extended the chassis and lengthened the body to 30 feet, increasing the capacity from 35 to 39. The rebuilt vehicles were treated as dual purpose, which meant they saw use on local services (the only time I rode on one was on the Derby ‘town service’ 27 from Scarborough Rise to the bus station), and also express services, often to the East Coast on summer Saturdays. I’m not sure how much of a success they were, as they were withdrawn in 1962/3, only 2/3 years after the last of the unrebuilt examples. My photograph shows rebuilt 303 (RC 9668) and unrebuilt 768 (RC 9674), both from the 1947 batch, at Derby Bus Station in 1960. Extending the chassis and fitting a new body? Sounds rather like the Tilling fleets with the Bristol L to LL conversion. Who’s idea was it? Were not some of these Regals lengthened by Trent themselves but remained half cabs? I found this site by accident (What a fascinating place the internet can be) and have been delighted with the photographs and comments. I was with Trent from 1965 to 1967 prior to emigrating to Western Australia. 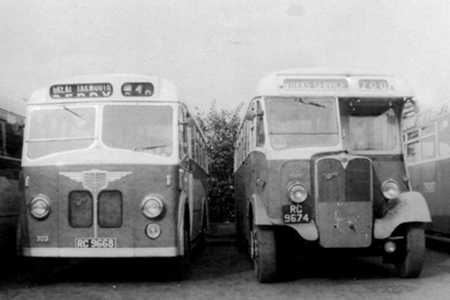 I worked at the Hucknall depot in Nottinghamshire where we drove mainly Leyland PD2’s and 3’s plus Atlanteans and Daimler Fleetlines. I never gave a thought, sadly, to taking photographs but I have found a few examples of vehicles similar to those that I drove. If anyone has examples of Trent buses I would love to see them. When I was a nipper we took holidays at Skegness and we stayed at digs near the coach park! I seem to recall one of the full front vehicle was used as some kind of booking office. Have I got this right? My father who had the same initials RC often commented the number plate would be just right for his own car this being before the craze was the general norm. To answer a couple of points, the rebuilt vehicles didn’t have new bodies. As Bob rightly states, the original bodies simply had the rearmost bay extended to achieve 30ft length and provide four extra seats. In halfcab form they had been used on long distance express services but attracted complaints from passengers because the original bus seats were very low backed. The rebuilt vehicles were given dual purpose seats although these were still rather spartan. The rebuilds gave between four and five years service, the last being sixteen years old when withdrawn, I suppose that was quite creditable for Trent who usually worked to a twelve year maximum fleet life. I’ve never known if the AEC radiator was retained behind the full fronts but the rebuilt vehicles had a reputation for getting extremely hot in the cabs and were known as ‘sweat boxes’ None of them were extended and retained half cabs. Quite a few rebuilds saw further service after leaving Trent. The mobile booking office at Skegness was a much earlier vehicle, a pre-war SOS. Chris – Thanks for the additional information. The pre war SOS mobile booking office (RC 2721) was saved for preservation, and is currently being restored by LVVS at Lincoln. There is mention on this Trent page of a mobile booking office used at Skegness. 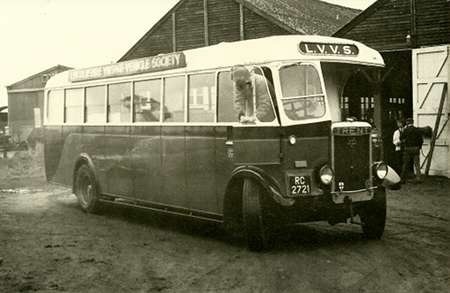 This was RC 2721 a 1935 BMMO DON converted to the booking office in May 1953, acquired by the Lincolnshire Vintage Vehicle Society in April 1965. Still with them in 2013 and being put back to its original condition. Alan Hiley in his contribution of 24/08/2013 makes mention of Trent Motor Traction Co., 1935 BMMO DON – RC 2721 being with the Lincolnshire Vintage Vehicle Society, in preservation. I thought you would like to see it in their ownership.